Naim NAC A5 Altoparlante Cavo. 2 x 5m. Spine Naim. Pair of nordost blue heaven rev 2. Nordorst Blue Heaven Speaker Cable 2 x 5ft lengths . 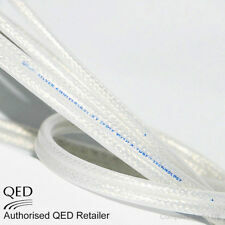 QED Micro Speaker Cable 15 metres. Condition is Used. Dispatched with Royal Mail 1st Class. 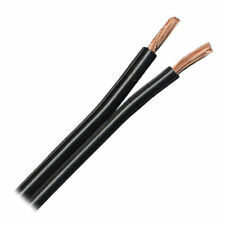 15 m of low profile speaker cable, ideal for home cinema set ups. Linn K-20 Speaker two lengths 4,6 m each. Over 9 m total. Soldered linn banana plugs. If you're looking at this add you know about the quality and power you can run through this cable. Award Winning Cables from QED. QED Silver Anniversary XT. Award Winning Speaker Cable from QED. The precise cylindrical construction of the silver-plated, 99.999% pure, oxygen free copper cables reduces the distortion caused by ‘skin effect’. C ho rd C le ar wa y loudspeakerc ab le - in us ed a s ne w. Professionally en de d withQ ED g ol d pl at ed banana cl ip s.
Naim Nac A5 Speaker Cable 2 lengths 3,5 m each. Soldered Naim banana plugs. Reference Silver Anniversary XT. TM and conventional stranded/solid core speaker cables convey signals in a linear way. However, at high frequencies, X-Tube. Loop resistance 0.021 Ω/m. Cuts down on the amount of audio signal energy lost due to cable capacitance. Le condizioni sono pari al nuovo. Con scatola originale. The inner cable is not compromised and both cables work as they should. 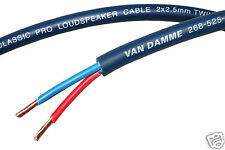 QED 79 Strand speaker cable combines convenience and performance, small enough to fit in the most demanding places. Award Winning Speaker Cable from QED. QED 79 Strand. QED 79 Strand cable is available with or without plugs in anylength up to 100m. 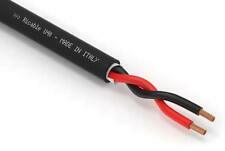 Straight Wire Encore Speaker Cable in buone condizioni estetiche e funzionali-. Linn K400 Bi-Wire Cavo Altoparlante di alta qualità 4.7M - GRATIS P&P! 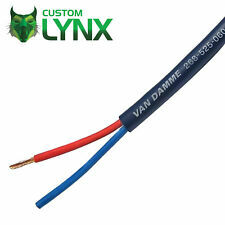 LINN K400 Bi-Wire High Quality Speaker Cable 5m in length and terminated one end. Used but perfect condition. 10737 CAVOTWO CABLE SET. Questo cavo per altoparlante è idoneo per amplificatori con potenza fino a ca. 300 watt per canale amplificatore. assemblato con banane high end. CAVO DIGITALE PER DIFFUSORI. NORSTONE CL-400. PREZZO RIFERITO A 100 MT (BOBINA INTERA). · Length: 100 m. Ricoperti da guaina extraflex trasparente e molto robusta - SEZ. 4,00 MMQ. VINCENT HI-END SPEAKER CABLE. VINCENT HI-END SPEAKER CABLE SPECIFICS. Connectors: Spades goldplated or Bananaplugs goldplated. Isolation Material PVC, Cotton, PET Paper, Polypropylen, Sandwich-Construction. 163150 Rhodium Locking Banana 5m. BLACK RHODIUM ACT3 DCT 5m. Pair with Rhodium Plated Locking Banana Plugs. # Black Rhodiums Best Cables # Rhodium Plated Connectors # DCT Treated Twice. Ninja Performance from a cable half the size! Vendesi coppia di cavi per altoparlanti "Monster cable M1-MKII" da mt.1,50 cad. Contattatemi per ulteriori informazioni a riguardo. One 3m piece of QED silver anniversary biwire speaker cable. 3m in length from tip of bananas to end of cable. I cavi SC-2 sono intrecciati con la guaina protettiva ViaBlue ™ Cobra, la quale conferisce un estetica accattivante. Viablue SC-2 SINGLE-WIRE T6S BANANA PLUGS 500 cm - Speaker Cable Hi end (Couple). Connettori: Banana t6s. Condizioni pari al nuovo, usato pochissimo: vendo per passaggio a mono-amplificazione.